Recruiting cutting-edge scientists and engineers from Florida’s universities and research centers around the state, UCF I-Corps is now accepting applications until May 29, for admission into its fall program which begins August 24, 2015. The 10-week program will provide selected research teams with first-hand knowledge about entrepreneurship, while exploring and validating the commercial opportunities surrounding their invention. The NSF Innovation Corps (I-Corps) is the agency’s signature effort to assist teams of university scientists and post-doctoral or graduate students to venture outside of their laboratories and into the marketplace to test assumptions about the commercial market opportunity. The primary goal of NSF I-Corps program is to provide participants with the tools to connect lab discoveries to market and societal needs. “The I-Corps program is the NSF’s conduit for researchers that have a technology or an invention to validate the commercial opportunity. Over a ten-week period teams get out of the lab to conduct about 100 interviews in order to test the validity of their assumptions about the market need and opportunity. Teams decide whether or not to pursue the path of additional funding and company formation at the conclusion of the program,” said Ivan Garibay, UCF I-Corps Program Director. 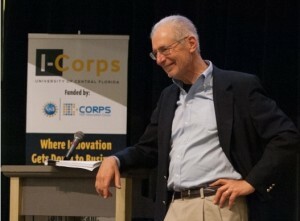 UCF I-Corps teams generally consist of an Entrepreneurial Lead (EL), Principal Investigator (PI) and Industry/I-Corps Mentor. These aspiring entrepreneurs will participate in an immersive, hands-on program designed to teach them how to test their ideas, gauge feasibility, understand market demand, examine competition and develop mutually beneficial partnerships to help transition their ideas into profitable enterprises. Once teams complete the UCF I-Corps program, the path to commercial market continues with opportunities for funding in NSF’s national I-Corps program and SBIR/STTR grant funding as well as tapping into the entrepreneurial ecosystem within UCF and the community. UCF has one of the nation’s best innovation and entrepreneurial networks and is one of 36 universities nationwide, leading an I-Corps Site program. NSF has also established regional I-Corps Nodes, located in such innovation hotspots as Washington DC, New York City, Michigan, San Francisco and Boston. A nationally certified teaching team oversees the teams and coaches them toward success. UCF’s certified teaching team consists of a mix of experienced entrepreneurs, investors and UCF faculty including Thomas O’Neal, Oscar Rodriguez, Michael O’Donnell, Cameron Ford, Ivan Garibay and David Metcalf. The entire team earned its certification via training and support by Jerry Engel. Engel, professor at Berkeley (University of California), is National Faculty Director of the NSF I-Corps program and co-creator of the Lean Launchpad methodology and curriculum. Despite his advocacy and the backing of the Obama administration, they met a mixed fate in Congress. The biggest hit is Innovation Corps (I-Corps), a program that teaches academics how to commercialize the fruits of their research. It would get a 14% bump in 2016, to $30 million—a significant amount of money for a program whose core element is a 10-week training program for three-person teams. When a guy from Silicon Valley who’s been a part of two multimillion-dollar startups and is co-owner of a venture capital firm talks, entrepreneurs need to take note. And that’s just what more than 100 people did at downtown Orlando’s Church Street Exchange event on Jan. 29. Jerry Engel visited Orlando to not only kick off National Science Foundation’s I-Corps program at the University of Central Florida, but to view Orlando’s tech scene and offer his insights. A seasoned veteran of Silicon Valley will visit Orlando next month. Venture capitalist Jerry Engel, an adjunct professor at University of California at Berkeley will appear in a question-and-answer session that will cover his career as an investor. Engel founded Berkeley’s Lester Center for Entrepreneurship and teaches students about venture financing, innovation and private equity. Jerry Engel had some advice for Orlando’s tech entrepreneurs Thursday: Determine the community’s leaders and make it easy to find them. But, above all else, keep them here. There’s a new program at UCF to help get innovative research and startup companies into the marketplace faster. Called I-Corps, the program is the first Florida location for an effort headed by the National Science Foundation. I-Corps used a ten-week program to help students and faculty test their ideas so they can launch a profitable business.